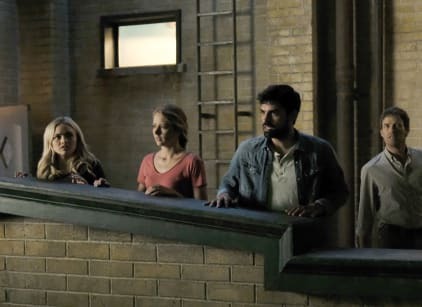 A lady is talking to the group about the gifted splitting up, and how it's important mutants have a place of their own. They don't care about breaking the rules. It's all for a future (Reeva). Sentinal services are doing a raid on an apartment complex. The kids are mutants, and their parents are shot telling them to escape. The dad (vampire bill) is monitoring the scanner and informs his people of the raid. They're beating people and taking mutants. The xmen mutants arrive to save them. It's the 3rd raid in a month. The four save two groups of mutants and bring them back to the doc. The mom goes to see the dad in a hidden room. He's making fake ids for the mutants they saved. They've been searching for Andy and Lorna for a long time. The triplets and Reeva took Lorna and Andy to show them where Lorna will give birth. The government thinks the group of mutants died in Atlanta. Marcos wants to find Lorna before the baby is born. Lorna is feeling some discomfort with the baby. Lorna is tired of being alone. Refa tells Lorna she needs her. She says she would sacrifice anything. The triplets get through the gate. They bribe the lead guy to get the facility for the birth. (Reed) Dad hears a high pitched sound when talking to his daughter. He thinks she needs to lead her own life. The mom wants her to focus on finding her brother Andy. She goes up to the roof, and Andy's there. He's blonde now. He tries to get her to use the duplicate power,l but she resists. It's a dream. Caitlin is the mom. She tries to get info out of the daughter about Andy. Kate calls Marcus about the mutant hacker. She's done waiting to find Andy. She has a bad feeling the birth won't go well. John and the gate girl go out on a mission. Gate girl is in disguise with contacts and makeup. Kate and Marcos are meeting with the hacker. They go into the building to meet Wire. He's not happy Kate's there. Marcus vouches for her. He says he has nothing, but he does. He knows about the Hellfire Club. He wants to re-negotiate. Kate gets the hacker dude and gets shot in the side. The sister went to the bus station and got picked up. They are still going to look for the sister. Marcos and Kate burst in the door, and they start patching Kate up. The dad is popping pills. He starts hearing noises again and collapses on the ground. His veins start wiggling around. His powers are coming back. Andy and Lorna are hanging out. It's time for the baby to be born. The triplets tell them to lock everything down a level. They bring Lorna into a cage, but they're not ready. Marcus is looking at the computer and notices the electricity surging through the city. He knows what it means. Marcos brings Reed and Kate to the roof to show them the electricity. They figure she's having the baby. Lorna's in a lot of pain. She's not dilating. She could die if they don't figure it out. Marcos, John, and portal girl are following the electricity. Triplet is suggesting something to Rafe. The triplets show Lorna the dawn of a new age. Equality for all mutants. She starts to try to give birth again, and she shut down the entire grid. Marcos starts to cry. He thinks Lorna or the baby or both are dead, but they aren't. Lorna gave birth to Dawn.